Check out My Alteration Ego, my "alter blog" that's all about fashion illustration and everything that inspires it. 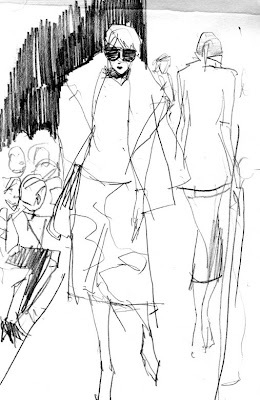 Why keep a separate blog about fashion illustration when this one could cover it, you ask? Well, I'll answer anyway. There's something about the subject of fashion and all that inspires it that, personally, I find so different from the commercial art world as a whole. Fashion illustration is created specifically for an industry that creates products made to promote a certain lifestyle, or at least the feeling of one. It does so without any apologies. All those things that inspire that sort of work from me, is a different animal all together, whether it's a particular designer or ad campaign, or a pretty coat I see in a store, or a fantastic bag I have to have. It's a purely subjective, unadulterated, guiltless pleasure of trendsetting aesthetics. So for that reason, I'm devoting a whole other blog, another side of my creative brain, to that particular subject, hopefully interesting enough for you to want to explore and seek inspiration. I've touched on a few style-worthy subjects, on this my current blog, but I believe there's a whole other world worth exploring that's different enough to deserve its own forum. I hope you go and explore it. Be patient, there'll be a slew of postings soon enough as it's still in its fledgling stage. I hope you enjoy it and what is to come! Keep coming back here for all other experimental illustration and all that is illustration.